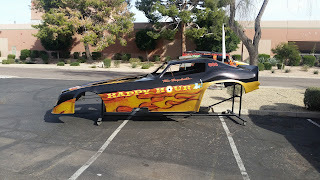 Vehicle Wraps and Screen Printing by Fast-Trac Designs & Phx Screen Printing: Do You Enjoy Race Cars? Do You Enjoy Race Cars? If you do we've got em! Fast-Trac Designs recently wrapped two nitro funny cars. One for Tim Boychuk and one for Ron Hodgson. Boychuk Racing has won several races and awards including 6 event wins and 5 track records. For Ron Hodgson a recent event known as March Meet in Bakersfield Canada became one for the record books as the team won first place in what was described as a "stupendous final round" by DragRaceCanada.com. The wraps that these funny car bodies received we completed with 3M film. The Boychuck funny car had two bodies wrapped the same with custom printed 3M 1080 series wrap film. The overall installation time was 7 hours per body. 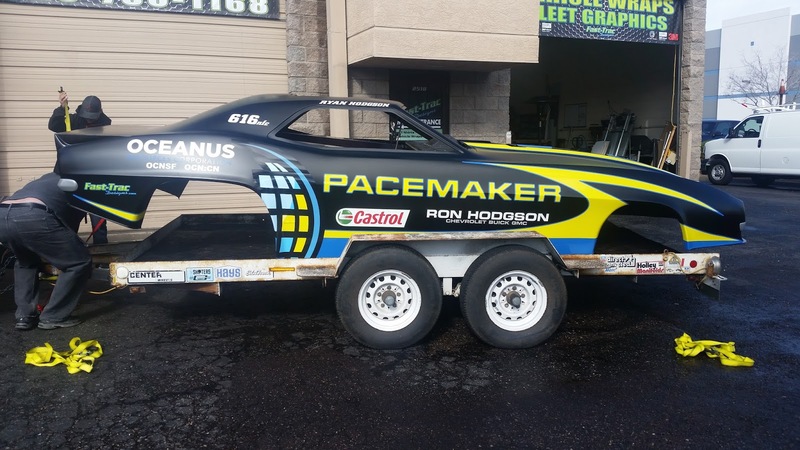 On Ron Hodgson's Pacemaker funny car the wrap was completed with custom designed and printed 3M IJ180-CV3 and gloss 8518 laminate. The estimated installation time was 3.5 hours. All of the race car bodies were installed in house by Fast-Trac Designs certified installers. You can expect to see these nitro funny cars throughout the race season as well as more race car wraps by Fast-Trac Designs. Vehicle graphics design offer the lower cost-per-impression of any form of marketing. It can generate maximum impressions on a daily basis.